Whether you are reproducing traditional album blocks or designing your own, this comprehensive guide is sure to provide both the information and the inspiration you are seeking. ​For each technique there is a project, a small block you can refer to as an illustration or actually complete. Work through chapter by chapter or simply turn to the book upon occasion with a particular need. You'll find it easy to use and full of sound information and inspiring ideas. 43 dimensional applique techniques, plus 23 embroidery stitches and suggestions for their use. 150 pages. Discover how easy it is to make your own applique patterns by folding and cutting a piece of paper snowflake-style. Learn to design more than a dozen different styles of blocks and borders. 143 pages. 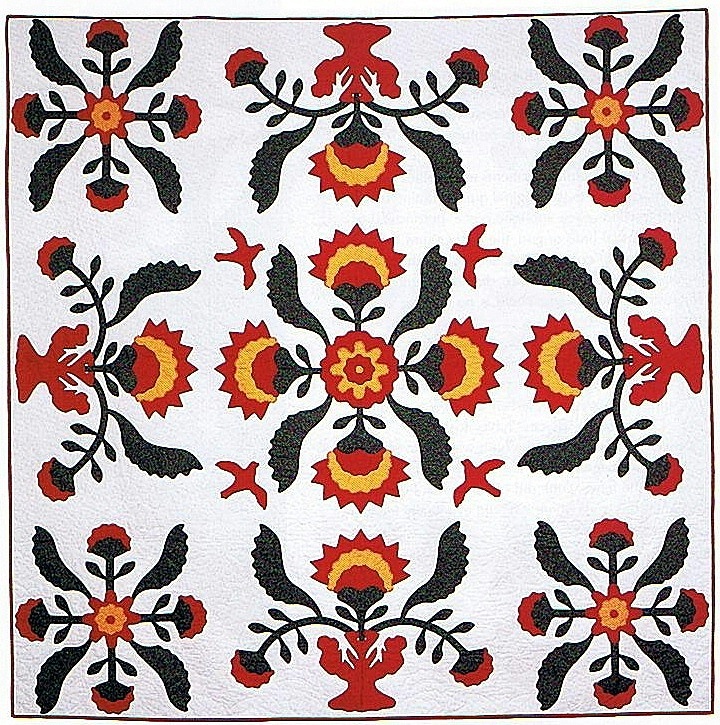 I challenged 9 friends to create quilts based on a magnificent nineteenth-century Coxcomb applique quilt. 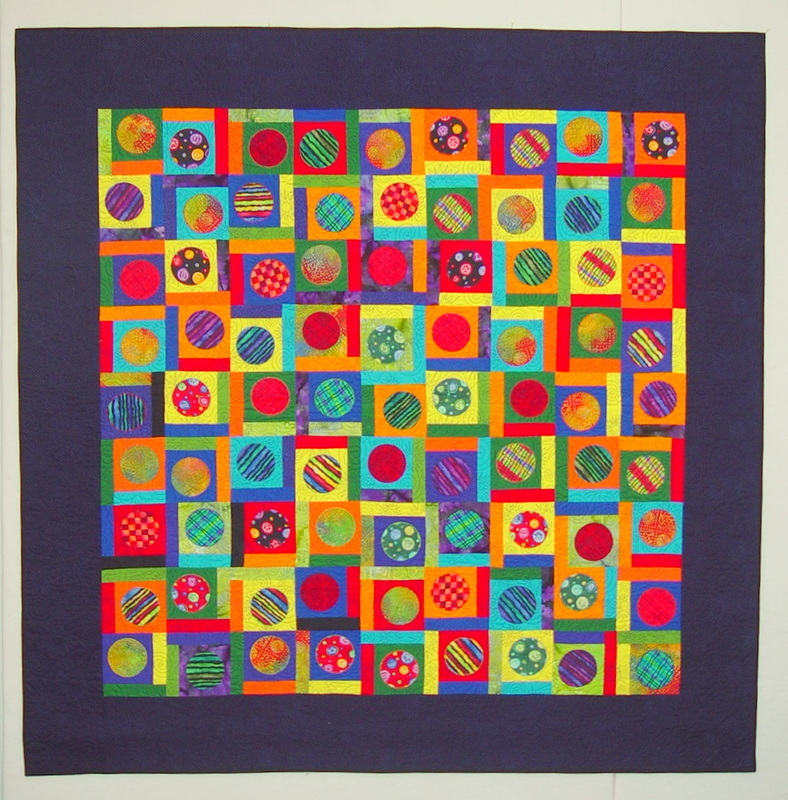 The result is 11 new quilt projects for you to sew and enjoy. 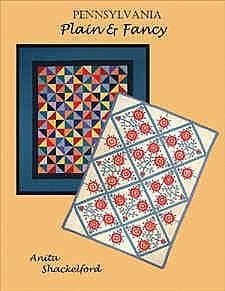 Each one contains full-sized templates and detailed instructions, along with the maker's description of how the quilt was designed and what makes it unique. 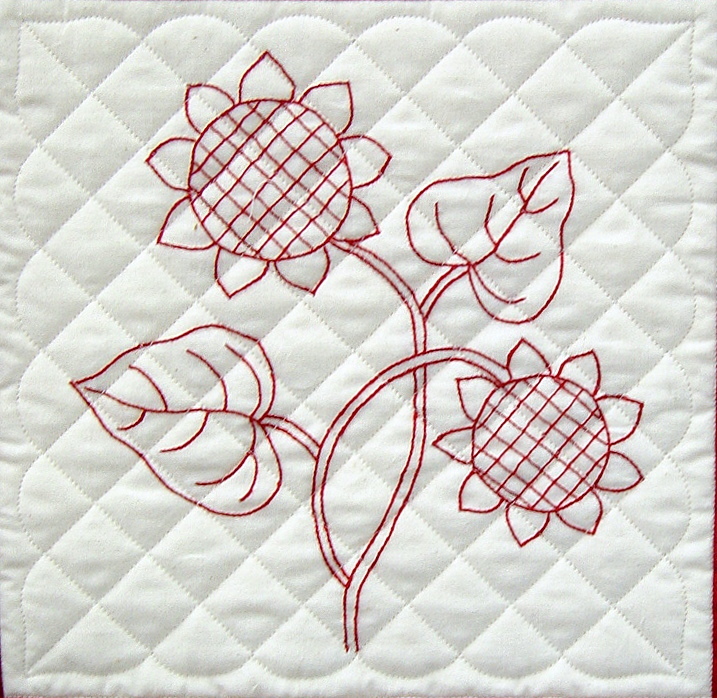 You can sew one of the beautiful quilts as shown or play with the pattern pieces to create your own Coxcomb variation. 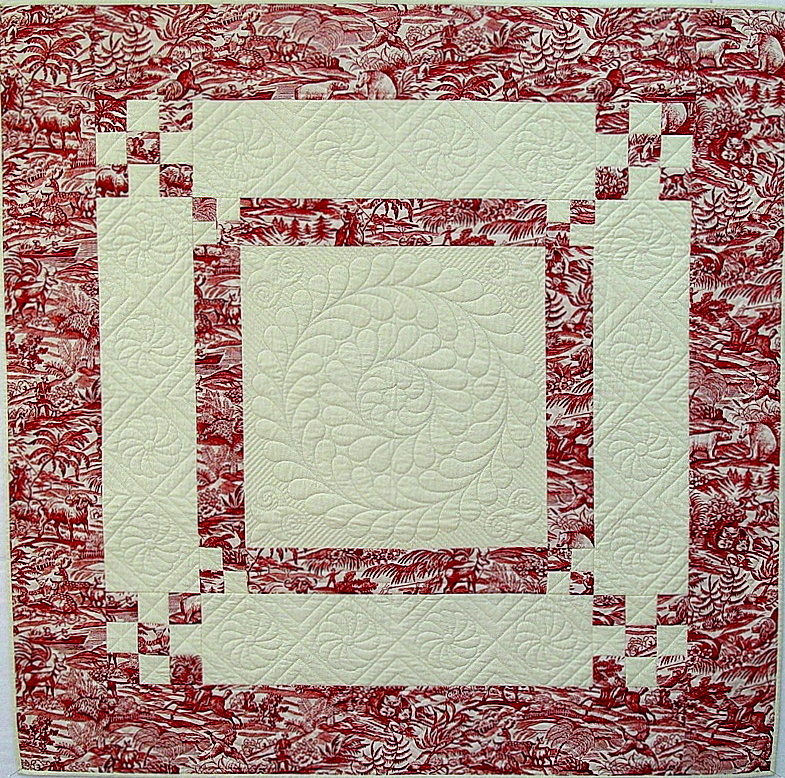 The first quilt I made was this careful reproduction of the antique piece. The design is the same and the colors are how I imagined the original must have looked. After this quilt was finished, the challenge was to see what else we could create by changing the color or layout of the pieces to make something new - but with recognizable ties to the original. Twelve new quilts are pictured, along with the templates and fabric requirements to make each one. 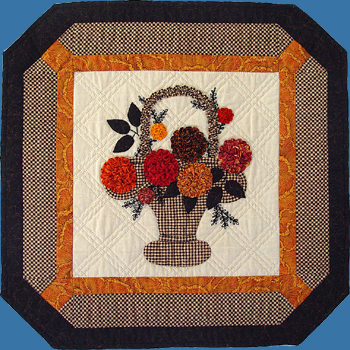 I hope they will inspire you to create your own coxcomb quilt. 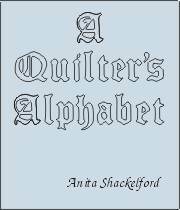 by Anita Shackelford, includes step-by-step photos and instructions for designing feather quilting motifs and transferring them to your quilt top. Working with simple tools, you can learn to create designs that will fit perfectly in the blocks and borders of your next quilt. Besides ideas for drafting your own designs, you will find a pattern section with over 100 feather designs in traditional, innovative and continuous-line styles. 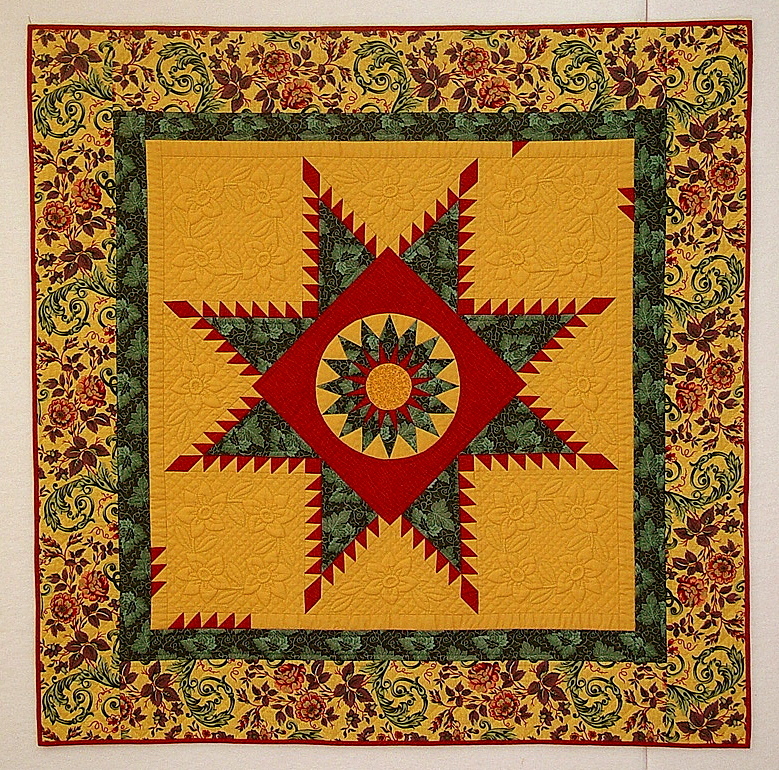 For even more inspiration, the gallery contains almost a dozen beautiful quilts made by some of today's top quiltmakers. 160 pages. ​the feather samples in this book. 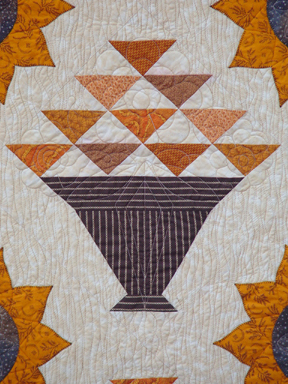 Learn how to successfully incorporate hand and machine quilting in the same quilt to add visual interest to your projects. 112 pages. 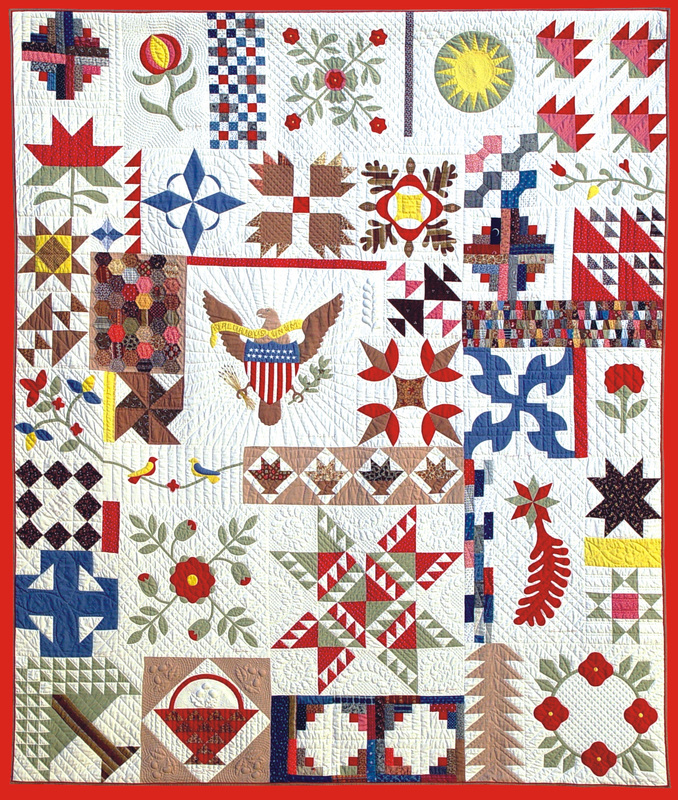 ​The Feathered Star wall quilt on the cover is both hand and machine pieced, hand and machine quilted, and includes trapunto in the background areas. Create a Little Piece of History! 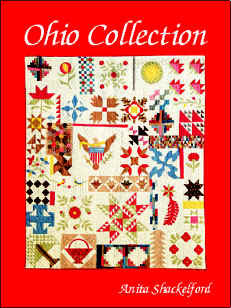 This book includes 44 historic pieced and appliqued patterns. 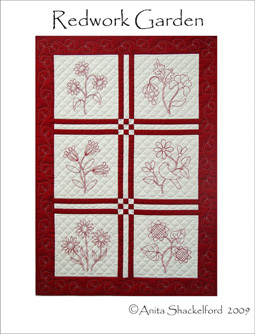 ​Discover designs that are perfect for you, whether you are a beginner or experienced quiltmaker. 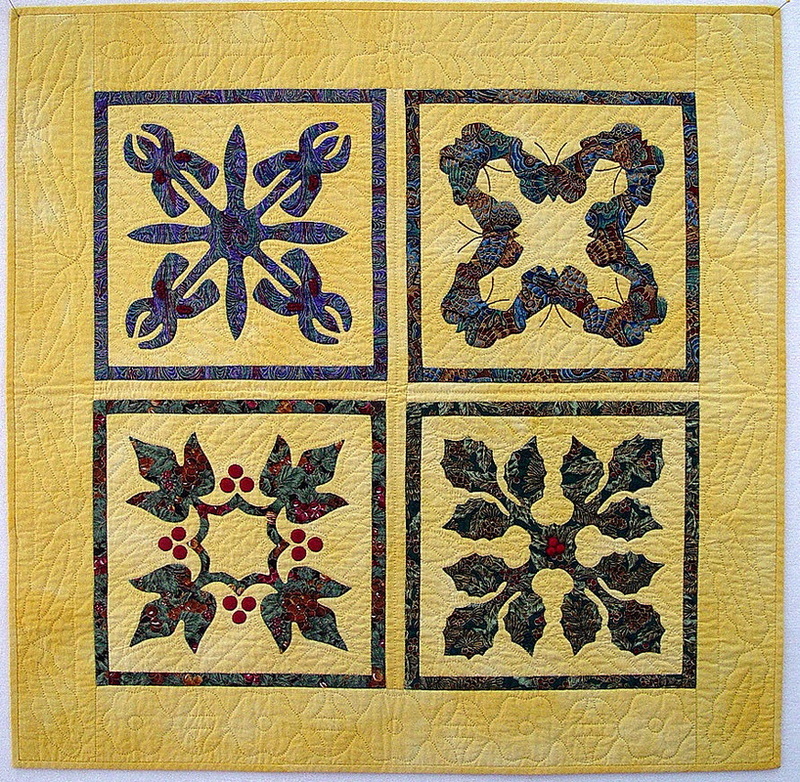 Work with templates or rotary cutting instructions to reproduce an antique quilt, or make a new one. 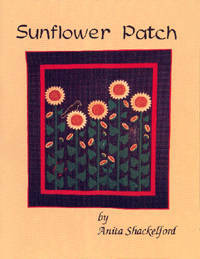 Includes patterns for 6 pieced and 6 appliqued quilts with projects for beginner and advanced quilters. 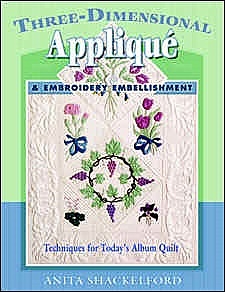 Also includes instructions for special techniques, such as folded cutwork applique, ruching, and trapunto. 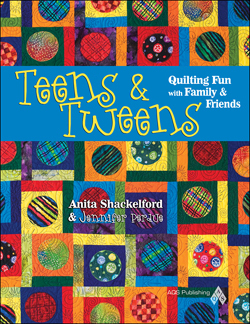 My daughter Jen and I enjoyed putting together this great book of sewing and quilting projects, perfect for kids or adults of any age. ​ If you have young people in your life and you'd like to share your passion for working with fabric, you'll find lots of projects here. 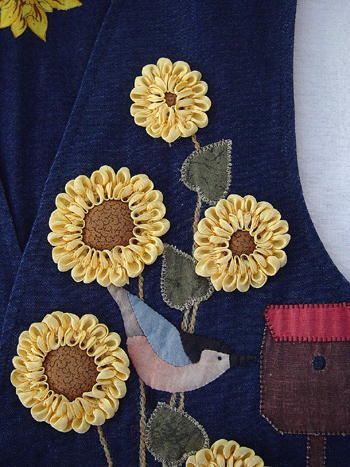 This bird and sunflower motif is appliqued with a combination of hand and machine work and embellished with strip ruched ribbon and beads. Use on vest, shirt, or other garment. 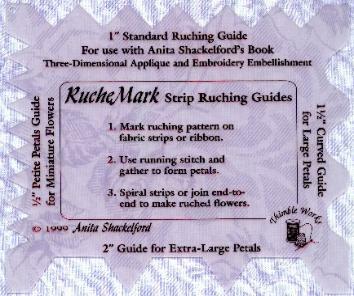 Order the strip ruching template to use with this pattern. 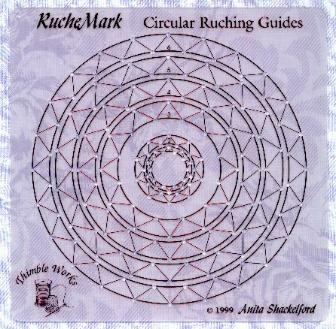 using both strip and circular style ruching. Directions for wall hanging or twin size quilt. ​the strip and the circular ruching guides. 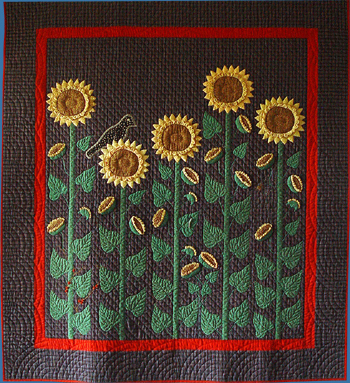 This almost life-size folk art sunflower design is appliqued with a combination of hand and machine work. Pattern includes full size templates plus instructions for strip ruching, embroidery, and free-form embellishments. 12 pages. 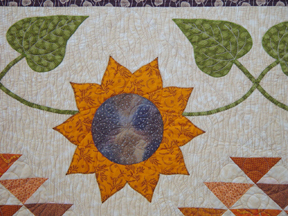 Use the strip ruching guide to make the dimensional sunflowers on this quilt. A Quilter's Alphabet is the perfect way to personalize your next quilt. 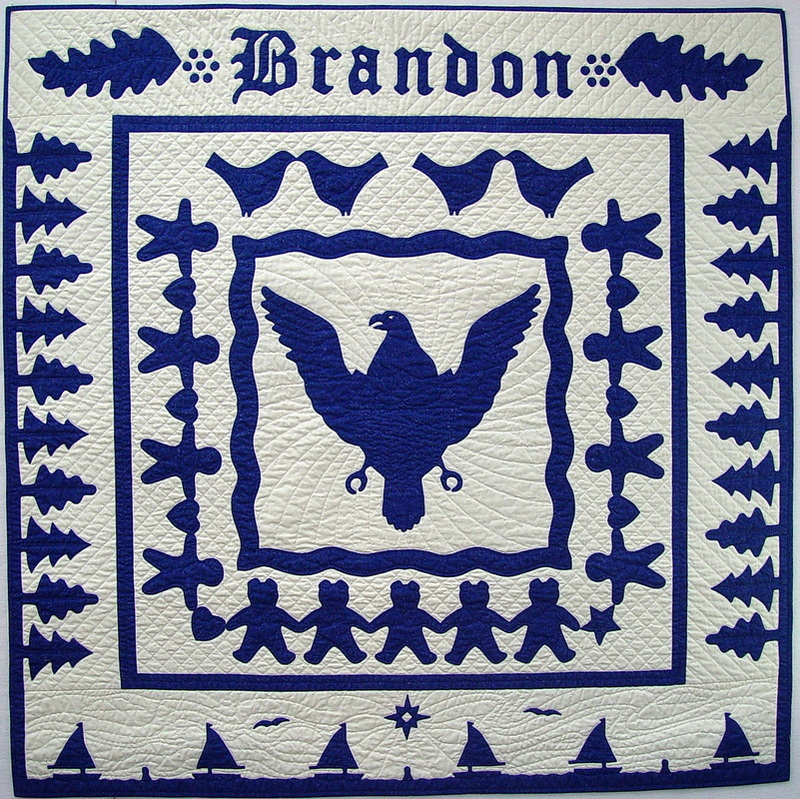 These are the beautiful Old English letters that I used on our family album quilts and on Little Boy Dreams, which I made for our grandson, Brandon. Line drawings of letters, numbers and punctuation are full size, ready to use. Capital letters are 4" high; lower case letters and numbers are 3" high. The pattern book includes instructions for fused or stitched applique, and padded trapunto, plus suggestions for embroidery or ink work, and several project ideas. 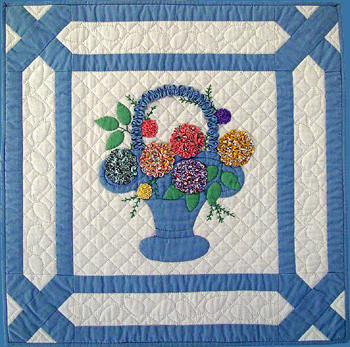 Charming floral designs work up quickly with a stem stitch and embroidery floss or thread of your choice. 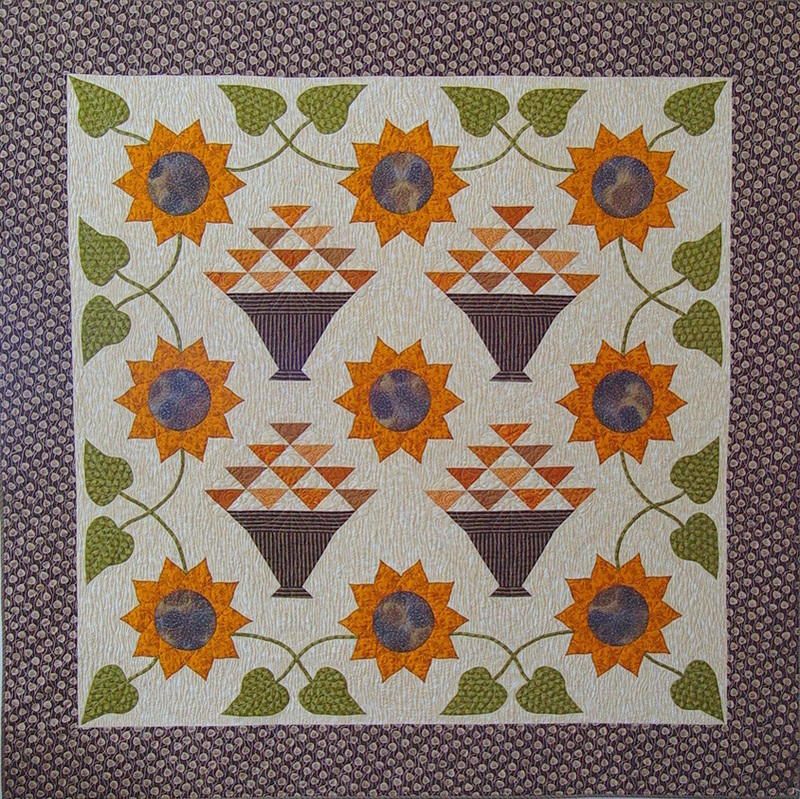 ​This pattern was very popular when it appeared on the cover of Love of Quilting magazine, September 2006. Now the pattern is available from our website. 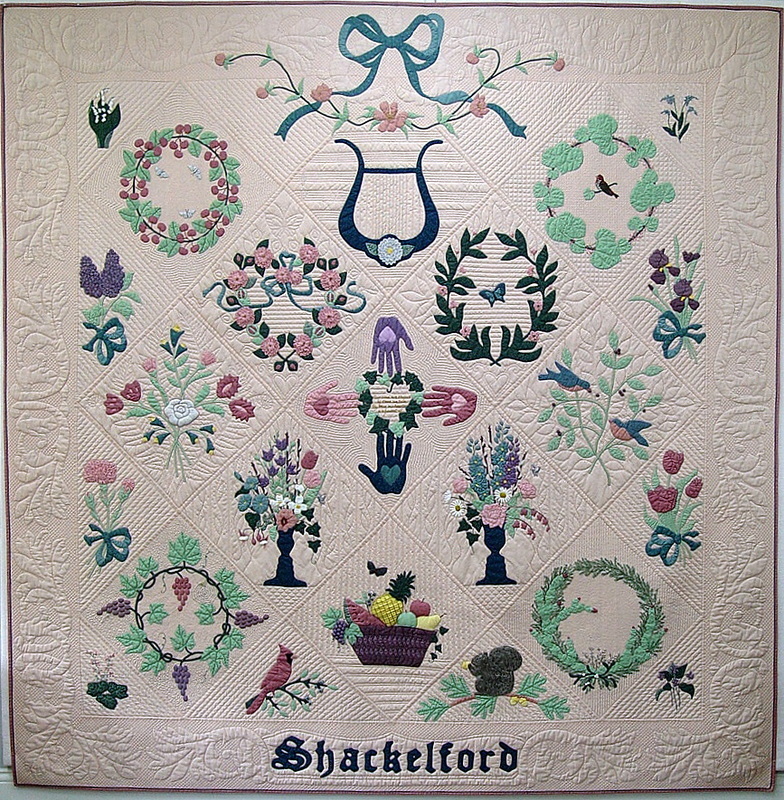 The combination of pieced baskets and flowing applique wlll make this one of your favorite quilts. 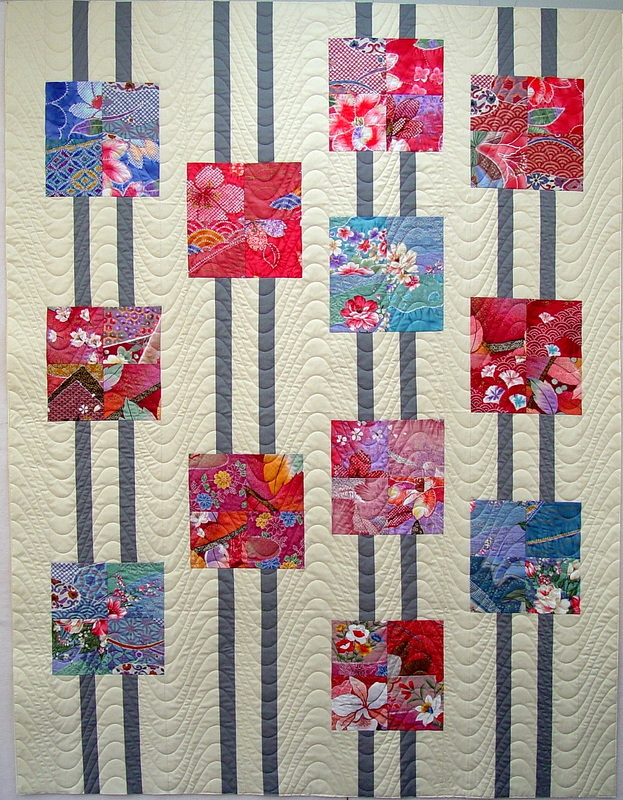 Boxes and Ribbons was one of my first ventures into Modern quilting. I've had many requests for the pattern, so I'm offering it here in pdf form. Click on the link below to visit the store. 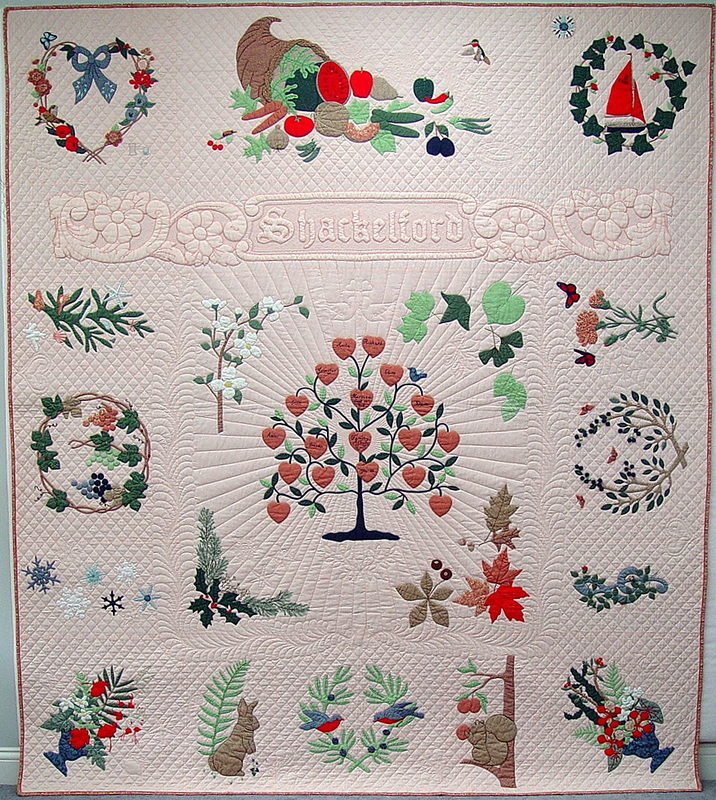 Large Cookie Cutter animals are appliqued to the center panel of a sweet child's quilt. This quilt is one of many pieces I have finished in my Quilt Rescue project. The original textile was two 100 lb sugar sacks sewn together to create a long panel. The sacking had been woven with stripes and was intended to be recycled as dish towels. A creative soul decided instead to applique animals on it. Your center panel can be striped, pieced, or plain, as you like. For the rescue, I added the pieced blocks and sashes on each side to give it better proportions and to make it a usable size. I machine pieced the blocks and quilted the quilt on my Statler Stitcher. Choose your favorite methods to complete the quilt. 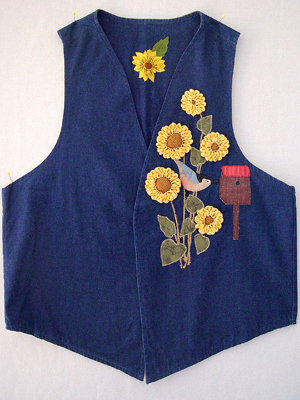 PDF includes instructions for cutting and piecing the Hen and Chicks blocks, full size applique templates and suggestions for applique by hand or by machine. Automatic shipping calculations are sometimes higher than necessary. Actual shipping cost will be charged and excess postage will be refunded.